TIMi Suite is a comprehensive and integrated collection of data mining tools that cover all analytical needs of different enterprises in the banking, insurance, and telecommunication industries. It is a complete suite that produces segmentation analyses and predictive analysis that delivers the best business insights about B2C, or B2B marketing, advertising, and more. The platform forms a real decision-making system that facilitates proactive management and allows businesses to utilize their corporate data to come up with new ideas, make critical business decisions, and improve corporate performance. TIMi Suite is a reliable, user-friendly solution that gets rid of all the technological risks associated with predictive analytics projects. It eliminates the tedious and laborious modelization procedures and allows users to automatically create the most robust and precise predictive models in real-time from different databases regardless of the size or content. The suite is composed of the following software: TIMi, Antella, Stardust, and Optimal-it. 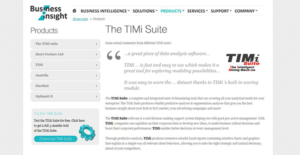 TIMi Suite is an all-inclusive suite that is composed of cutting-edge, second-generation predictive analytics and data mining tools that are more scalable, faster, and able to produce precise results. The platform leverages the power of the real-time analytical engine that helps you increase the return on investment (ROI) of your business’ marketing campaigns. It utilizes unique mathematical and technological approaches that make it easy to achieve the best models and the highest level of accuracy in any real-world dataset. One main advantage of the TIMi Suite is that it is user-friendly. The application avails three unique user interfaces which are easily adapted to the technical degree of the user. One the interfaces; the wizard-based interface allows you create basic models in a few mouse clicks. On the other hand, the advanced interface provides detailed control of the common modelization parameters. This interface makes it easy to remove some columns, filter out some rows of a database, create “on the fly” new targets, and more. Lastly, there is an expert interface built to offer access to all low-level parameters of algorithms available inside in TIMi. Additionally, the predictive models developed with TIMi Suite are simple, yet extremely accurate. The software makes you understand how these predictive models calculate their predictions, thereby averting possible errors that could jeopardize your marketing campaigns. It also creates instantaneous reports that provide precious insights into your business. Better still, TIMi is fully integrated with SAS. This means the solution can natively read SAS dataset files, permanent SAS variables formats, and SAS variable labels. You can also run this solution from any SAS environment to compute scoring, create new predictive models, and more. TIMi functions as a real plugin inside a SAS system which allows you to import generated models in a native SAS base code. If you are considering TIMi Suite it might also be beneficial to check out other subcategories of Best Predictive Analysis Software collected in our database of SaaS software reviews. Organizations have unique needs and requirements and no software solution can be ideal in such a scenario. It is futile to try to find an ideal off-the-shelf software system that meets all your business needs. The smart thing to do would be to modify the application for your special requirements, employee skill levels, budget, and other aspects. For these reasons, do not hasten and pay for well-publicized leading applications. Though these may be widely used, they may not be the perfect fit for your unique needs. Do your groundwork, investigate each short-listed platform in detail, read a few TIMi Suite reviews, call the maker for clarifications, and finally settle for the product that offers what you want. How Much Does TIMi Suite Cost? TIMi Suite doesn’t reveal its enterprise pricing structure. Contact the vendor for a custom pricing quote. We realize that when you make a decision to buy Predictive Analysis Software it’s important not only to see how experts evaluate it in their reviews, but also to find out if the real people and companies that buy it are actually satisfied with the product. That’s why we’ve created our behavior-based Customer Satisfaction Algorithm™ that gathers customer reviews, comments and TIMi Suite reviews across a wide range of social media sites. The data is then presented in an easy to digest form showing how many people had positive and negative experience with TIMi Suite. With that information at hand you should be equipped to make an informed buying decision that you won’t regret. What are TIMi Suite pricing details? What integrations are available for TIMi Suite? If you need more information about TIMi Suite or you simply have a question let us know what you need and we’ll forward your request directly to the vendor.